Sleeve gastrectomy is a surgical procedure for weight loss. 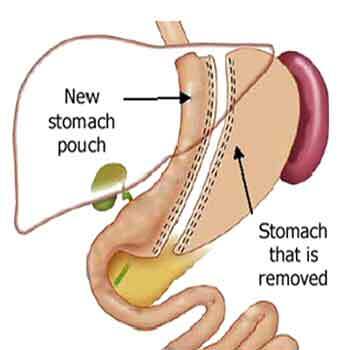 In this procedure, the stomach is reduced to about 15% of the original size of the stomach by removing a large portion of the stomach along the greater curvature. The portions of stomach which secretes Ghrelin (hormone which increase appetite and cholesterol) and acid (which digests food) in excess is removed. Ghrelin or the "hunger hormone" is also called lenomorelin. Ghrelin is secreted when the stomach is empty and when the stomach is stretched the secretion of Ghrelin stops. Ghrelin acts on hypothalamic brain cells to increase hunger and to increase the secretion of gastric acid and motility of gastrointestinal tract to prepare the body for intake of fodd. Sleeve Gastrectomy leads to reduction in food intake and also alteration in hormonal milieu which leads to usage of stored fat for caloric requirement. Thus, by natural way, weight gets reduced and in few months' time major portion of excess weight is lost. There is no need for taking medicines continuously and the weight loss will be sustained. Studies show this as the best method. Laparoscopic Sleeve Gastrectomy (more than 30 BMI patients): Laparoscopic Sleeve Gastrectomy (LSG) is a well established bariatric procedure of treatment for people who are obese and having type 2 diabetes, not achieving desirable control with medical and dietary therapies, especially when there are other major co morbidities. Obese class I patients with obesity related comorbidities that could not be controlled with medicines. The portion of stomach which secretes Ghrelin and acid in excess is removed. This leads to reduction in food intake and also alteration in hormonal milieu which leads to usage of stored fat for caloric requirement. Thus, by natural way, weight gets reduced and in few months time major portion of excess weight is lost. There is no need for taking medicines continuously and the weight loss will be sustained. This has got very good results without significant nutritional deficiency and hence most preferred. It is safe and effective in weight reduction as well as resolution of associated co morbidities especially diabetes mellitus in obese class II and obese class III categories. LSG is generally recommended in patients with BMI>35 kg/m2. The study conducted by Dr. R. Padmakumar et al. shows that laparoscopic sleeve gastrectomy is effective in obese class I group as well (resolution of diabetes is 86.6% in patients with obese class I) and the resolution of type 2 diabetes achieved is sustained  (Figure 2).